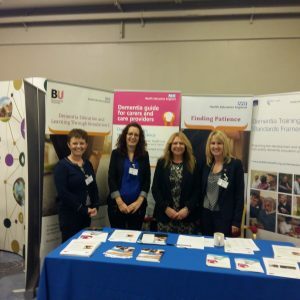 Prof Jane Murphy, Dr Michele Board, Dr Michelle Heward and Dr Ben Hicks attended the 13thAnnual Dementia Congress (6th and 8th November 2018). 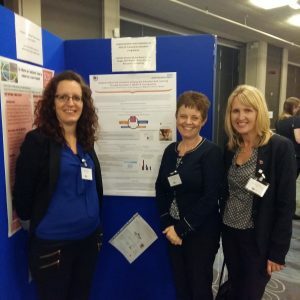 Dr Michelle Heward presented a poster on the ‘implementation and evaluation of the Dementia Education And Learning Through Simulation 2 (DEALTS 2) programme’ a project funded by Heath Education England (HEE) to develop and evaluate an education toolkit for acute care settings. During the first plenary session, Minister of State for the Department of Health and Social Care, Caroline Dinenage MP, highlighted that “staff training for dementia is increasing with programmes like DEALTS 2”. As part of the dissemination funding for the DEALTS 2 programme, Michelle and Jane were also invited to talk to conference attendees visiting the HEE stand about the programme evaluation. Dr Michele Board presented her research funded by Alzheimer’s Research UK in a paper ‘Evaluating the impact of the Virtual Reality app ‘A Walk-Through Dementia’ on year one health care students’ clinical practice’. Dr Ben Hicks presented a paper ‘Game Plan: promoting gaming technology amongst dementia practitioners’ based on his European funded research. 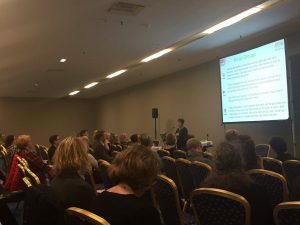 The annual conference attracts practitioners, academics and people with dementia and carers to discuss the latest innovations and research in the dementia field. The motion this year was ‘the right to services is more important that disability rights for people with dementia’ and stimulated a dynamic exchange of opinions during the many plenaries, parallel sessions and workshops.